Photo during my basic training in February 2000. I started my morning yesterday with coffee and chit-chat with my coworker’s daughter, who is heading to Air Force basic training in a few weeks. 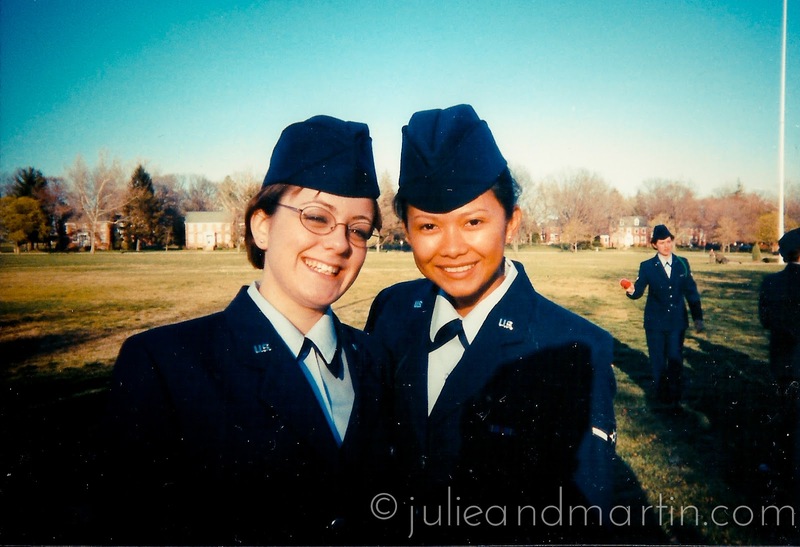 We did the math: she was THREE WEEKS OLD when I arrived at Lackland AFB back in January 2000. I must seem ancient to her, but I like to think my advice is timeless. What an exciting time for this young lady! I told her to be wise in choosing a battle buddy, and later, good mentors. Seek out those who are level-headed, optimistic, and genuine. It’s pretty crazy to think that the people I went thru basic training with … if they are still in the service, they are probably thinking of retiring in the very near future. Isn’t that crazy? It’s been one year since Martin graduated from Air Force Basic Military Training (BMT). This first year has been pretty interesting, if I do say so myself. I’m not sure how it escaped me, but it did. He meant enlisting, of course. What a year, right? And we’ve got much to look forward to this next year. He’ll be leaving our home for another three months for more training in another state. I’ll be on my own again with the kids. But we got it. It’s cool. It’s what he signed up to do. For today’s Flashback Friday, here’s the post about that day and the reasons behind it. We hope you all have a great holiday weekend! Some final words with one of his tech school instructors. In the midst of all the excitement with Jaz last week, I didn’t get to share the good news. He officially finished his military training last Wednesday and left technical school as a certified air transportation specialist* for the US Air Force Reserve. I took off from work that day and drove down to Ft. Lee to attend the ceremony. A few other family members were there as well, and we all got to watch as our Airmen were given their certificates and words of encouragement from class leadership. And I even got to step up and take the grip-and-grin photos for everyone. After the ceremony, we headed over to the dorm so Martin could collect all his belongings, and within an hour, we were on the road again, heading home. Martin is no longer considered a “pipeline” Airman. He’s done with his initial training. Starting next month, he’ll be putting on the uniform at least one weekend a month, two weeks a year, and doing his work at nearby Andrews Air Force Base. Of course, there may be some travel to other locations here and there, some time apart, some more training down the road. But now? He’s back to be being a full-time stay-at-home dad. He’ll be posting soon about his tech school experience, and of course, we’ll be sharing as we follow this new path for all of us, especially as he re-integrates with the household again. It probably goes without saying that we are so proud of him. * Here’s an Air Force video showing you what air transportation specialists — or “Port Dawgs” — do in the Air Force/Air Force Reserve. Last weekend was pretty awesome for all of us. Once again, we traveled south to Richmond to spend the Memorial Day weekend with Martin. Not only were we blessed with three whole days together, but there was a twinge of excitement knowing it was the last time we would make such a trip since Martin graduates from tech school very soon, and will be home for good. We decided to go all out. This is the blog post about tech school. The one I meant to write and publish earlier, after Martin’s graduation from Basic Military Training before life and all its distractions got in the way. As you know, Martin is attending his technical school for his job in the Air Force Reserve right now, but this post is specficially about my tech school experience, when I went through it back in the spring of 2000. It’s been a lot easier keeping the kids connected to Martin now that he’s at tech school. We no longer have to wait for letters, or the ten-minute phone call every two weeks. Now, during the weekends and evenings, all I have to do is flip open the laptop and sign in to talk with Martin. Because our laptop is portable, we’ve been able to incorporate Martin in some of our household activities, and vice versa. One morning, Lola and I lay in my bed, laughing as we watched Martin shave with a traditional razor and shaving cream. He just propped up his cell phone on the sink and talked with us as he did it. When he’s here at home, he normally uses an electric razor, so Lola found it pretty amusing to see him like that. Watching Martin shave one morning. Other times, Martin’s watched as Jaz sits through a nebulizer treatment, asking him questions and getting Jaz to hold up his fingers as they played counting games. I’ve sat our laptop on the kitchen counter and prepared dinner while Martin feasted on cereal or sandwiches in his dorm room, and the girls have held dance competitions in the family room with Martin voting from the laptop. It wasn’t like this back in 2007 when I deployed. But there were a few times we were able to chat over the web cam using AOL chat — Kandahar being one that comes to mind — and we got to see each other in real time. In the moments when we could communicate, it was so wonderful. I remember seeing Miss C bouncing around behind her Dad, wanting to show me random items from home (“See, Mom? Here’s our lamp! Here’s my teddy bear! Wanna see this plate?”) and just looking adorable. Sometimes, we just sat and stared at each other without saying anything. Yet, when it came time to log off and say goodbye, ugh. That was the worst. Martin even wrote about it back then. We didn’t know when we’d see each other again. Technology is much better and more reliable. I’m home. Martin’s just two hours away and safe, too. And I can expect with reasonable certainty that when the day is winding down, and the kids are ready to say goodnight, I can flip open the laptop and send a note, and Martin’s right there ready to connect. Martin got to reunite with the whole family this past weekend. Ever since graduating from Basic Military Training at Lackland Air Force Base in Texas, Martin’s been attending technical school at Fort Lee in Virginia. For the longest time, I thought this part of his training was going to continue in Lackland, as mentioned in his orders. While it is true that the training group is based in Texas, Martin’s school is part of a joint training facility located on an Army base, just like my own tech school experience. You can imagine how thrilled we all were when we realized that Fort Lee is only two hours away from us in Northern Virginia. That Sunday after his graduation ceremony was the last we saw Martin while down in Texas. He earned a town pass for the day in two ways. First, he won it by maxing out on the physical fitness standards, earning himself a “warhawk” status for extraordinary fitness. Because of that, he got a certificate, a t-shirt, and a town pass. This incentive is something new to BMT (or at least, new to me), and when Martin told me about it over the phone, his German accent threw me off, and I misunderstood that he was a warthog. It was a few days later until I realized my mistake. I just assumed he was referencing something from BEAST week, and didn’t bother to get clarification. It’s Warhawk: the Air Force God of Fitness. The second way Martin earned the Sunday town pass was through his flight, and their designation as the honor flight. All the others in his flight also got to spend one extra day with their families as a reward for earning the most points through their exams, inspections, and fitness tests. So, Miss C and I picked up Martin early Sunday morning and immediately drove down to the city, where we enjoyed breakfast on the Riverwalk. Halfway through our meal, an older gentleman approached us, and introduced himself as a former B-52 pilot. He had been eating at the table behind us with his family, and when he saw Martin in his uniform and overheard our conversation, he realized Martin was a recent BMT graduate, and he wanted to treat us. So he bought our entire breakfast, thanking Martin for his service. The gentleman wasn’t the first to thank Martin that weekend. In fact, just about everywhere we went, people approached Martin to shake his hand, thank him for his service, and welcome him to the Air Force. Martin said this made him feel really awkward because not only is he naturally a pretty humble dude, but for so long, it was people coming up to me and thanking me for serving, and occasionally treating me (or us) with some random act of kindness. But most of all, Martin said he felt weird about it because in his mind, graduating from BMT didn’t really count as a significant contribution of service. Every time someone approached Martin, I wanted to speak up about my husband, to bring them up to speed about how he’s already served and sacrificed. And it’s not even that he gave up his own Bundeswehr career, or offered such unconditional support to my own Air Force career. It’s just that, in addition to all things that motivates one to join the military, Martin really and truly knows how hard it is, and how much is given and lost when one puts on the uniform … and how mundane and ordinary working for the Air Force can be … and how exciting … and how draining human politics and office politics and DC politics can be in the military, and how much it can change you, and not always for good … and all the other things that make life in the military one of the hardest and most stressful career choices out there. Most new Airmen do not have that perspective. But despite having witnessed all of that through my career and those of our good friends, and despite having a comfortable life as a stay-at-home dad with us at home, my warthog STILL decided to serve. The three of us. That’s Miss C sporting the panda mask she got at the San Antonio zoo. The rest of that Sunday was definitely more low-key. After breakfast, we let Miss C decide our plans. This led us over to the IMAX theater near the Alamo, where we saw a documentary about monarch butterflies. Afterwards, we drove back to our hotel, where the three of us ordered room service and watched animal reality television shows featuring adorable puppies and psychotic cats while all piled up on the huge bed. The only thing missing were our two babies, Lola and Jaz. 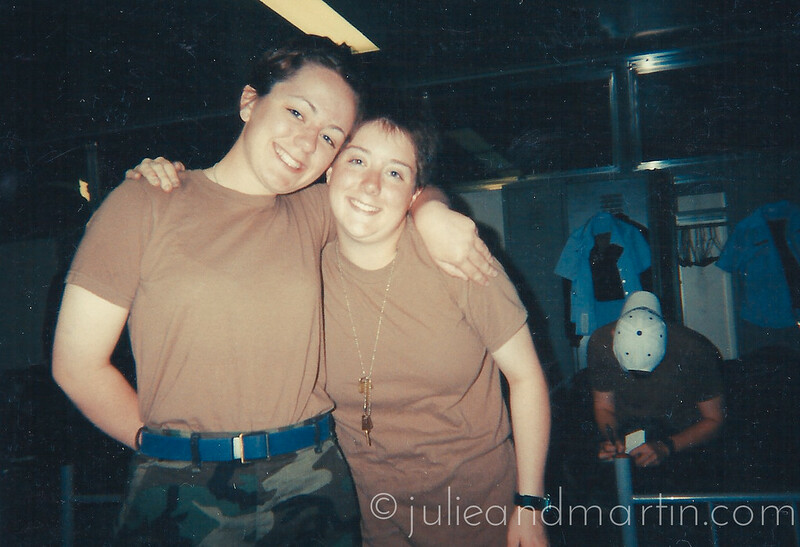 At least, though, we knew that the hardest part — BMT — was over, and we were that much closer to being all together again. 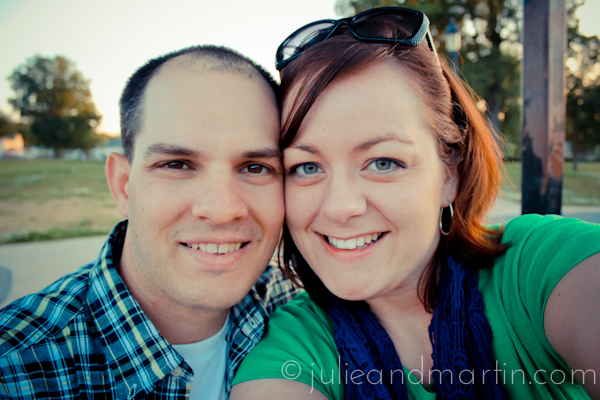 Our goodbye to Martin that day was relatively quick and painless. I pulled into the parking lot next to his dorm, helped him unload his new luggage set, and gave him a quick hug and kiss goodbye. He had an early morning flight out of Texas — the airport bus picked him up at 2 am — and then he would be off to technical school to learn how to become an air transportation specialist. This meant he was now a lot closer to home, too. For the longest time, I thought his tech school was there at Lackland Air Force Base. But as it turned out … of all the places he could have gone for his training, his school is at Fort Lee, Virginia. Just two hours south of where we live. Can you believe that Martin already wrote something for the Air Force’s official blog? That Sunday, while we were hanging out in the hotel room, Martin typed up some thoughts about his BMT experience.